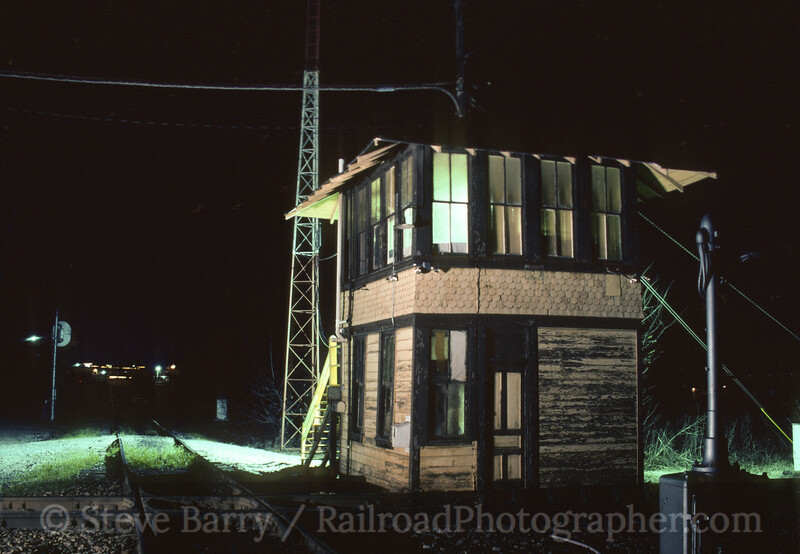 The railroad interlocking tower (or signal tower) was ubiquitous at one time in the U.S. They could be found every few miles along major mainlines, and guarding even the most rural junction where two railroads met or crossed. 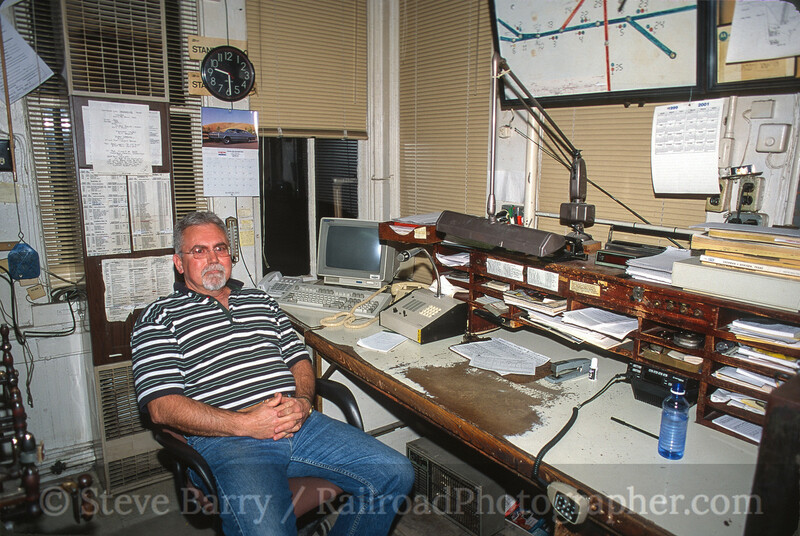 They were a place where railfans could stop by to find out what trains were nearby, or simply spend time with the tower operator shooting the breeze. Today there are entire states without a single active tower located in them. One of the last of the classic towers that I visited was in Sherman, Texas, in March 2001. Tower 16 was built in 1903 to protect crossings of the Texas & Pacific, the Houston & Central Texas, and the St. Louis-San Francisco (Frisco). By the time I got there, the Frisco and H&TC had become a part of Burlington Northern & Santa Fe, while the T&P was operated by shortline Texas Northeastern. I had business in Grapevine, Texas, which is what brought me to the Lone Star State. With a free evening, I drove north from the Metroplex to Sherman, climbed the steps to the tower, and knocked on the door. The operator answered and I said, "I'm from New Jersey and I heard there's this really cool wooden tower that I just had to visit." He said, "You found the right place. Come on in." I spent the better part of the next two hours talking to the operator and exploring the tower. 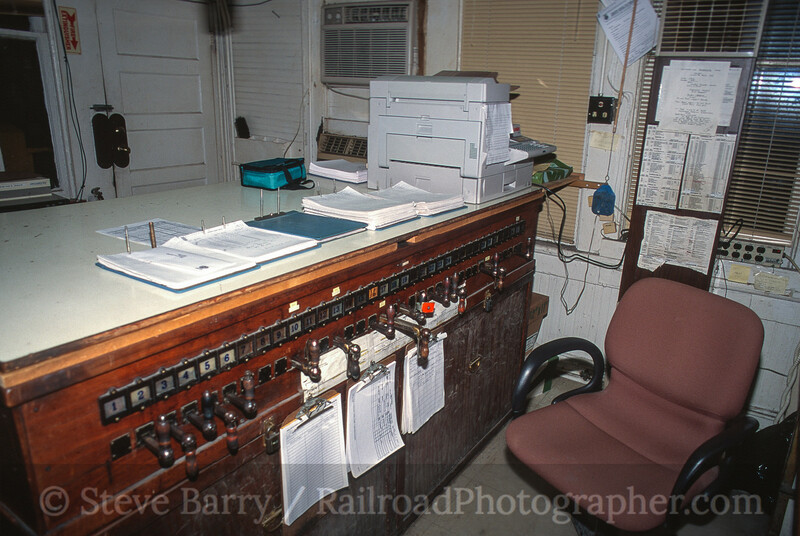 It was a mix of early 20th century railroad technology with modern computers and accessories scattered within. 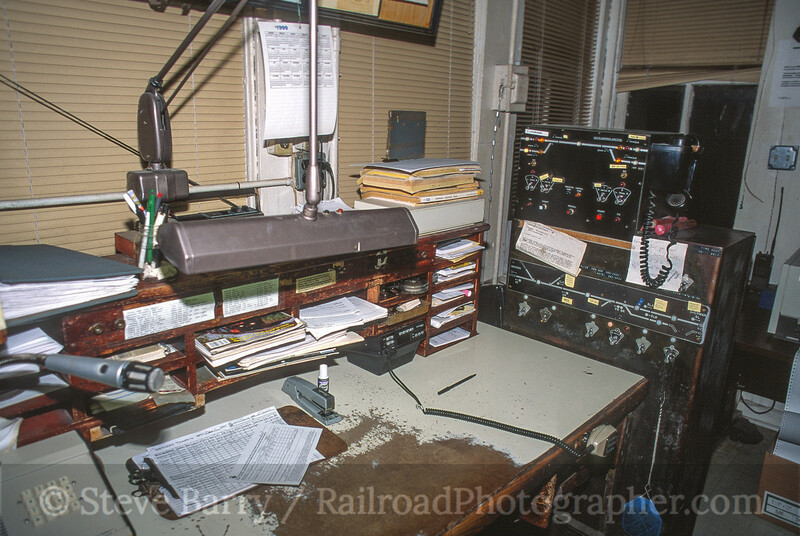 The operator's desk was well-worn from decades of recording trains and writing orders for movements through Sherman. 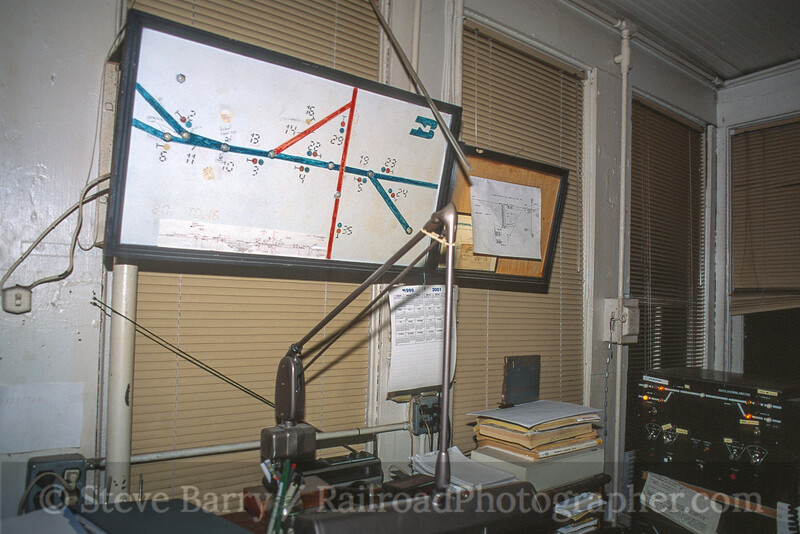 The rudimentary model board above the desk showed Burlington Northern (by this time BNSF) in green, and the Texas Northeastern in red. The operator was hanging out until the Texas Northeastern needed to cross BNSF on the diamond located in front of the tower; otherwise, everything was left aligned for BNSF movements. A couple of hours into my visit, he got word the Texas Northeastern train would not arrive until after his shift was over. With nothing more for him to do, he said, "I'm heading home." I got a portrait of my host, he locked the door, and we descended the stairs. The third trick operator would come in at 11:00 p.m. and line things up for the Texas Northeastern. Tower 16 was locked for the last time just a few months after my visit, on October 23, 2001. The diamond was removed, eliminating the need for an operator to guide the movements where two railroads crossed. As I said earlier, I had business in Grapevine, which is why I was in Texas. The business I had was a preview of Royal Caribbean's new passenger car for Alaska service, which was on display at the Grapevine Vintage Railroad. Ironically, after Tower 16 was closed, it was preserved -- it was cut in half (between the first and second story) and moved. And the place it was moved to? 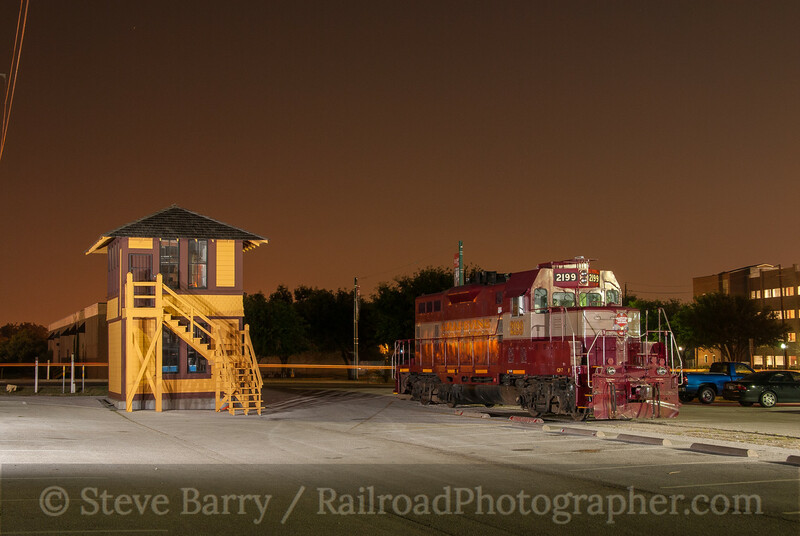 The Grapevine Vintage Railroad! The tower now resides just several feet from where I had toured the passenger car.